D-4 2017 CNBLUE Live [BETWEEN US] in Jakarta, Are You Ready BOICEs? South Korean pop-rock band CNBlue to hold a concert tour to celebrate their newest album, ‘7℃N’ visiting Singapore, Manila, Jakarta, Bangkok, Hongkong, and Taipei. 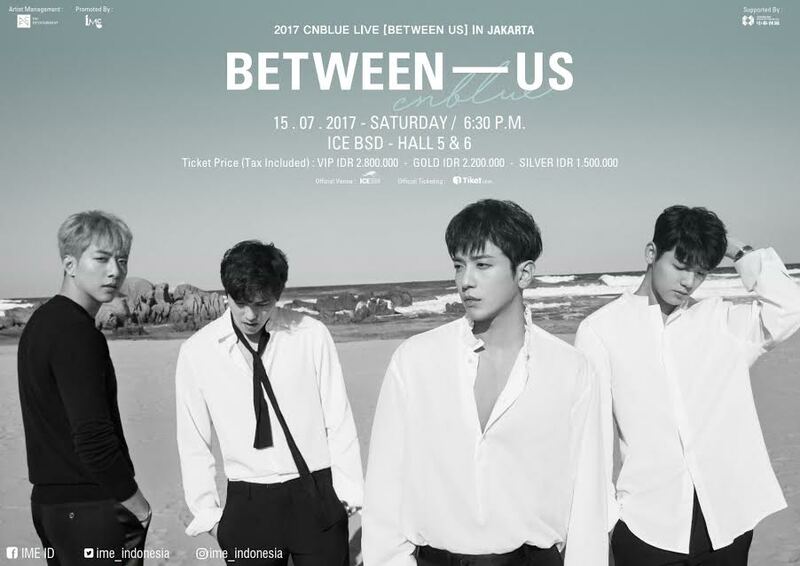 IME Indonesia proudly presents 2017 CNBLUE LIVE [BETWEEN US] IN JAKARTA on Saturday, 15 July 2017 6.30PM at Indonesia Convention Exhibition (ICE), BSD City. CNBLUE is a South Korean band, consists of Jung Yong Hwa as vocalist, Lee Jong Hyun as guitarist, Kang Min Hyuk as drummer, and Lee Jung Shin as bassist. The band started with their Japan debut in 2009 then official debut on 14 January 2010, with ‘BLUETORY’ and ‘ I’M A LONER’ as their title song. Their debut album stayed at the top of the Gaon Album Chart for two weeks. In April, their official fan club name was announced to be Boice, a combination of “blue” and “voice”. On May 19, their second extended play Bluelove was released and peaked at number three on the Gaon Album Chart. On September 2012, they held their first exclusive concert, CNBLUE Live in London at IndigO2 in the UK. They performed 22 songs in front of over 3000 fans. The concert ended in Seoul, South Korea on December 15 and 16 marked the band’s fourth concert in Seoul, which were sold out in 10 minutes. On CNBLUE’s 3rd anniversary their fourth mini-album Re:Blue with lead single “I’m Sorry” were released. The album went on to top the Gaon Album Chart for two weeks in a row selling a total of 126,000 copies. The single peaked at number 2 on the Gaon Digital Chart, and achieved an all-kill on music charts. The album continued to enjoy overseas success. Re:Blue ranked #1 on the Billboard World Album Chart, Japan’s Tower Records Chart. According to Taiwan’s music site ‘Omusic’, the album and title track “I’m Sorry” ranked #1 on the single and album charts, respectively even before the official release in the country. On 22 January 2013, FNC Entertainment announced CNBLUE’s Blue Moon World Tour, with Taiwan as the first stop for the world tour on April 6. They visited Asia, Europe, Australia, South America, and North America making them the first South Korean rock band to hold a world tour of this kind. According to a survey from Nikkei Style Japan, CNBLUE registered in number 40 in “2016 MOST MOBILIZATION CONCERTS POWER”, collecting 187.000 audience in total. Recently, after almost a year since the release of Blueming, CNBLUE is back on 20 March 2017 with their 7th mini-album, 7°CN with “Between Us” as the lead single. The mini-album peaked at number two on South Korea’s national Gaon Album Chart, selling over 47,000 copies since its release. Are you ready to meet the CNBLUE members in the concert 2017 CNBLUE LIVE [BETWEEN US] IN JAKARTA, Indonesian Boices?